Repair Cafés are starting to pop up around the world. This podcast has Martine Postma, the founder of the movement, talking about the idea behind the cafes. The Bowers, Reuse and Repair Centre based in Sydney, was established in 1998. They provide a variety of services, resulting in a wonderful community model which every town should have: workshops, plus repair, collecting and rehoming services. The Bowers is one of 30 Repair Cafés in Australia in 2019. There are approximately 15​00 in the world.......and the number just keeps on growing. The first Melbourne Repair Cafe opened its doors on the 21st February, 2016. Check out this fantastic 1 minute advertisment for The Bowers. Make your own alternative bags! Go to this website. I've made a few for family and friends. The fabric you need is the polyester woven tulle netting, not the stiff, brittle tulle. There are also some great material suggestions provided by people who commented on the website link. When sewing tulle on a machine you'll need to use a ball point 70 needle with polyester thread. If you don't have access to a sewing machine why not reuse the netting bags fruit and veggies sometimes come in. Cut the top off neatly when opening the bag. When the bag is empty, make a 2cm fold, twice, at the top of the bag and weave a piece of string around the top so it becomes the draw string. Too easy! Even easier, but not ideal; just reuse your plastic bags as they're normally clean. A simple way to reduce the amount of cling wrap you use. For most of your bowls, plates and cups, you will most likely have a plate, bowl or cup to use as a cover when storing food in the fridge. The added bonus is you can stack things on top. Most food wrapped in cling wrap needs to be used within a few days, so your crockery won't be away from its normal position for too long. Toys are an important part of a child's life. We all know toys break. Here are some tips and ideas I've come across to reduce the number of toys sent to the bin. Respect - Teach children to respect their toys. Tasmanian artist Sonia Singh up-cycles dolls that were destine for the bin. Be inspired by Sonia’s creativity and open your mind and heart up to other upcycle ideas. Click here for Sonia’s website. 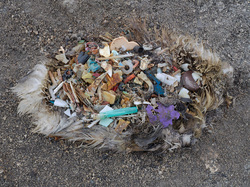 Three artist communicating environmental waste issues through their works. East Bay Depot for Creative Reuse ('The Depot') in Oakland, California has been running since the 1970's. Reverse Garbage: 'The Experts in Reuse' are based in Marrickville, New South Wales, Each year they prevent 100 football fields of items going to landfill. 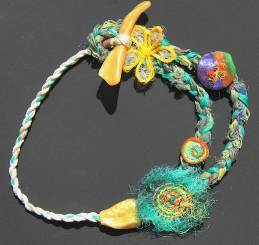 A group of Torres Strait Islander artist and fashion designers create colourful jewellery made from ocean collected ghost nets. The island Erub is home for the Ailan Pasin group. It's 160km off the tip of Cape York. 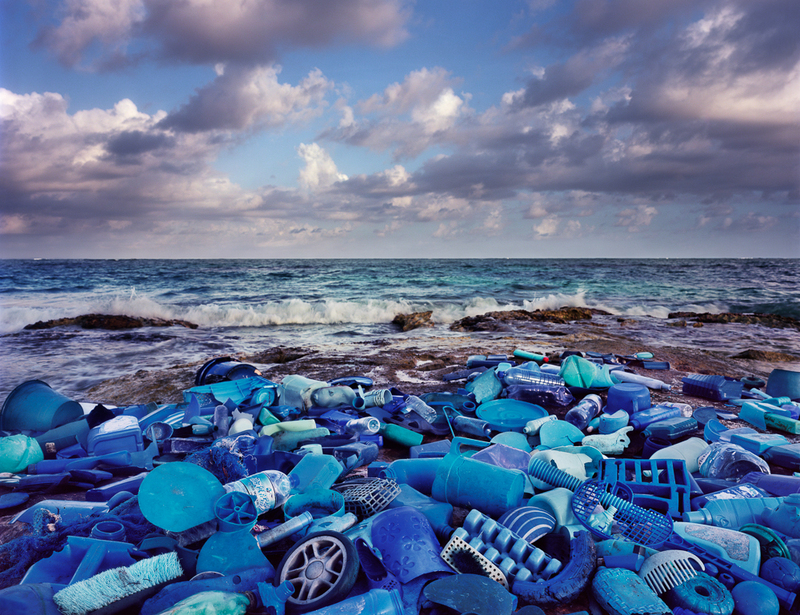 The Erubam le (people) are confronted with our ocean waste. 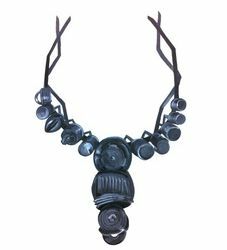 It may seem like a small amount of waste used in these fashion pieces, but the message these jewellery pieces carry is enormous. People all over Australia seek salvaged materials for projects. Keep the rustic look or make it shinny and new. Whatever you're after The Junk Map does exactly what it says, it provides you with a map to the junk stores. 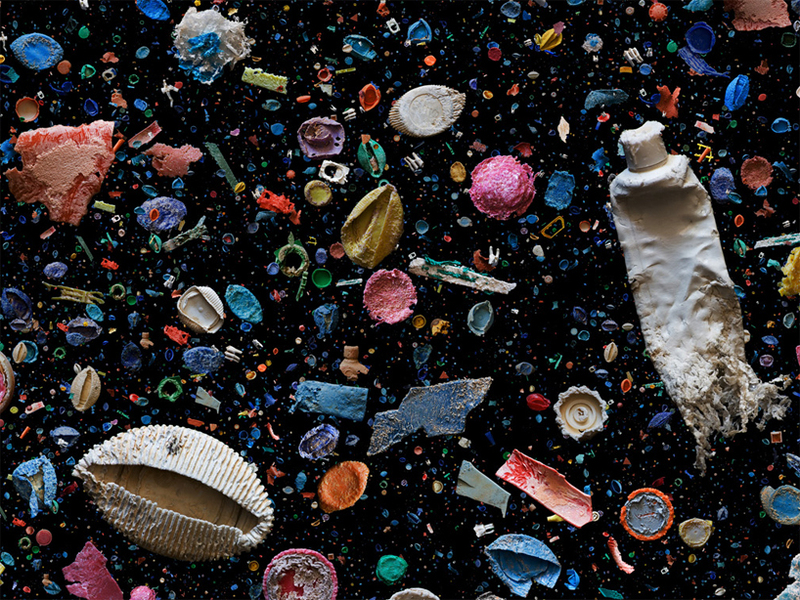 Artist, Carolyn Cardinet, makes art from found plastic. 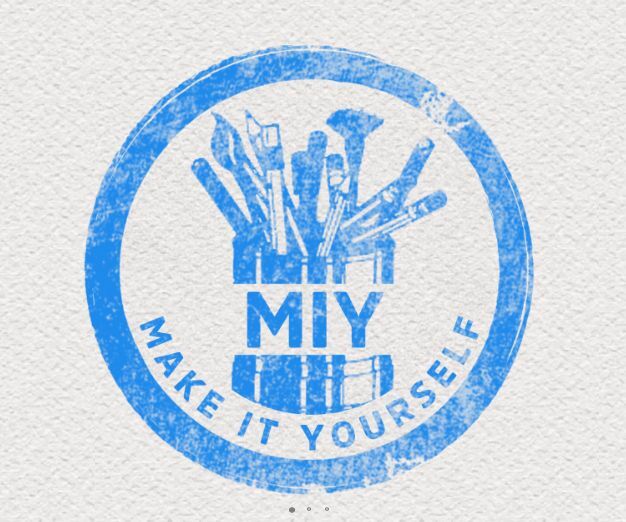 She aims to put our everyday products and activities under the spotlight. Carolyn will be exhibiting at the Unicorn Lane Gallery in Ballarat from the 18th July - 29th September, 2016. 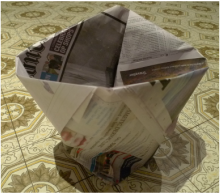 Replace plastic bag bin-liners with a cleverly folded newspaper. I came across the idea of making dishwashing scourers from jute. Since then I have made a few and handed them out to family and friends to test. They all came back with positive feedback. To make them I purchased some garden twine (triple twisted). Thanks to the internet I retaught myself to knit. Each scourer was about 8x8cm. Once the square was finished I twisted the two ends together to form a loop. Each scourer took about 30mins to make. When its time to throw it out, send it to the compost. The common green scourers that we are all familiar with are made of plastic. As you use them they become smaller and thinner. This means that each time we wash the dishes micro-plastic are entering the waste water system. It may seem insignificant but sticky-tape is still plastic. Check out these two sites to find out some clever ways to wrap gifts without using tape. Wrapping presents without tape or glue.